This easy beef stew instant pot recipe is going to make it so much easier to have a cozy bowl of beef stew, even on your busiest days! This recipes is gluten free, nightshade free, paleo, Whole30 and AIP friendly! Ready from start to finish in just an hour, this is the perfect weeknight dinner or Sunday supper. This time last year Dave was having some major GI distress and we were told to try the autoimmune protocol and remove nightshades to see if it would help with the GI issues. What we found was that he felt much better when we removed tomatoes from his diet, but that it didn’t provide the relief that he was after. It wasn’t until we also removed garlic and onions on a low FODMAP diet that he really felt some relief. Luckily we have been able to add back most foods, but he still avoids tomatoes, garlic and onion for the most part as we are still working on healing his digestion. 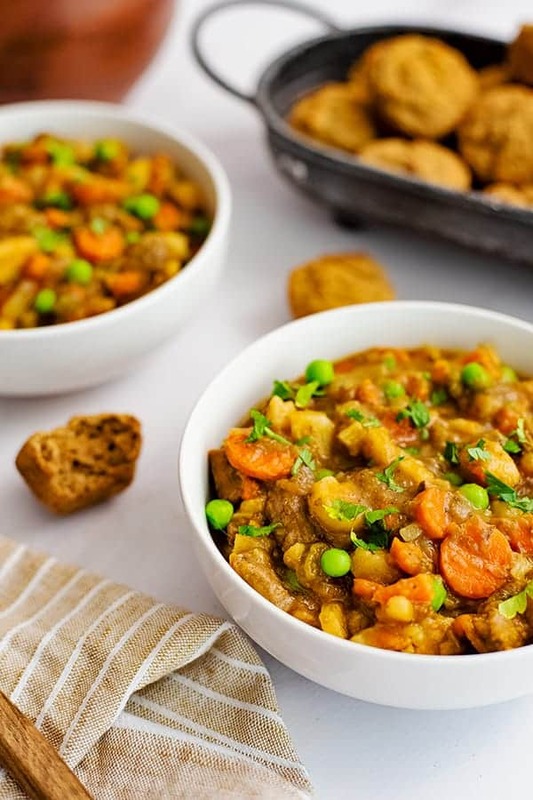 One thing we learned over this time was how great it was to consume foods like beef stew, where the proteins have had a long time to break down and therefore are easier to digest. Unfortunately, most of the recipes out there for beef stew had a tomato base, so I had to get creative to build a recipe he would enjoy that still reminded him of the beef stew he grew up eating! After being sick for so long, I understand the importance of food tasting like what you remember. That’s why I was so excited when Dave exclaimed that this easy beef stew (made in the instant pot) was one of his new favorite meals! What I love the most about this easy beef stew instant pot recipe is how easy it is to make! After searing the meat, you just add the rest of the ingredients to the pot, and then it’s hands off for the rest of the cooking process. 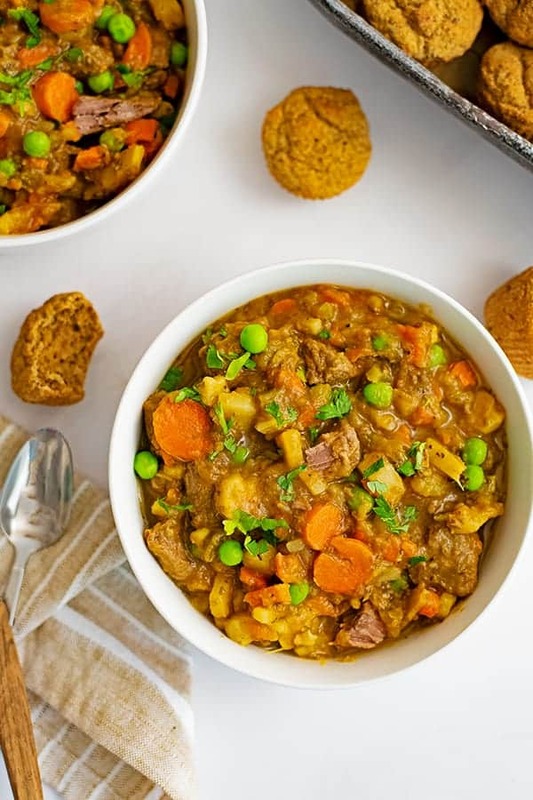 Unlike other beef stew recipes, this stew is naturally thick, so you don’t even have to thicken it once it’s done cooking. It’s 100% hands off! How do you cook beef stew in the instant pot? To make the tastiest, tender beef stew in the instant pot, you have to start by creating flavor by searing the cubed beef! I like to use garlic olive oil or garlic infused avocado oil to sear the beef and add some garlic flavor (since this recipe doesn’t use garlic seasoning at all). Once the beef is browned, add the remaining ingredients and cook on high pressure for 20 minutes. Allow for natural release for at least 20 minutes, and serve hot with your favorite sides! How long does beef stew take to make in the instant pot? From start to finish, it takes about 1 hour to make beef stew in the instant pot. Start by browning the meat which takes about 10 minutes (during this time chop all the veggies). 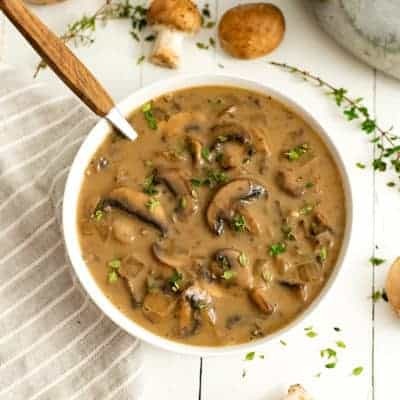 Once all the ingredients are in the pressure cooker, it will about 10 minutes to come up to pressure, 20 minutes to cook, and 20 minutes to cool. 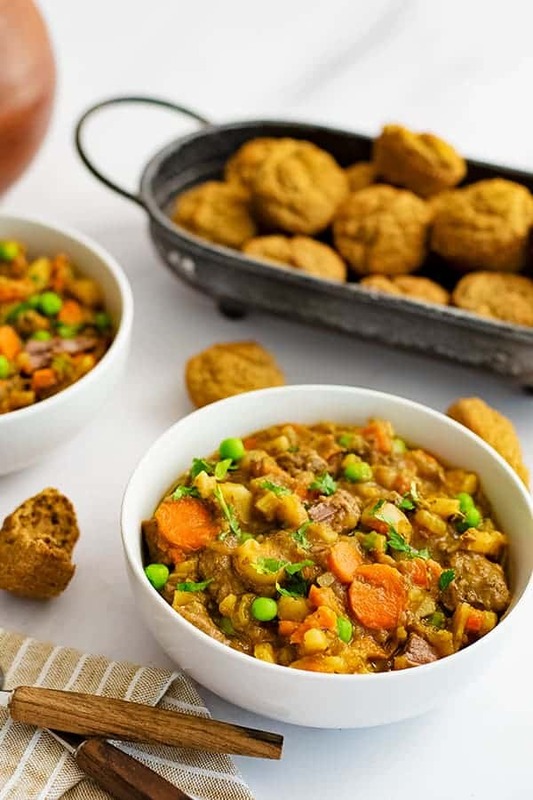 What is the best way to make beef stew meat tender? 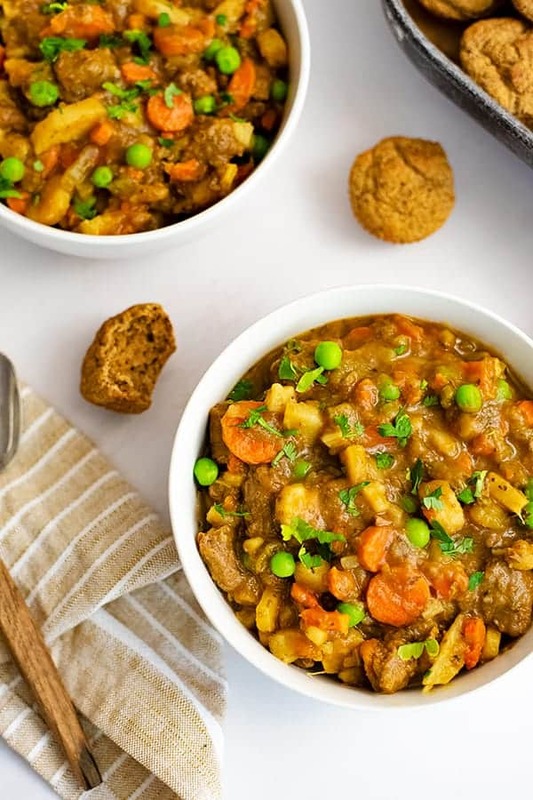 Beef stew meat is a cut of meat that requires either a slow and low approach (think crockpot or lots of time on the stove over low heat) or a high pressure cooking method that doesn’t allow any of the liquid to escape and tenderizes the meat because it’s under such high pressure. To sear the meat, you will want to use the “Saute” function, for 10 minutes, stirring once to get a good crust on the meat on at least 2 sides. To cook under high pressure, you will use the manual button and go up to 20 minutes. Make sure you have selected high pressure after selecting the manual button. For natural release, you will just allow the pressure cooker to slowly release the pressure on it’s own. When you release the pressure by turning the venting lid to “release” this is called a “quick release”. After 20 minutes of natural release, you can quick release if your pressure cooker still hasn’t released all of it’s pressure. Like I mentioned before, most beef stew recipes rely on the tomatoes to give a boost to the sauce, while also adding some acid to the recipe to help break down the beef. I use canned butternut squash puree (affiliate) plus balsamic vinegar in place of the tomato sauce. The butternut squash puree adds sweetness and helps thicken the sauce. The balsamic vinegar adds a little bit of that tart punch plus it helps break down the meat since it’s acidic like the tomatoes. Even if you like tomatoes and they don’t bother you, I highly suggest you try this recipe the way it’s written. Dave raves about how good it is, and it’s a great way to change up a classic recipe! If you are looking for something to serve with your easy beef stew, you can make these simple gluten free almond flour muffins while the instant pot is doing it’s thing. They are ready in about 20 minutes and are perfect for dipping in your stew! This easy beef stew instant pot recipe is going to become one of your favorite weeknight meals! It's so cozy and ready in just under an hour, perfect for dinner any day of the week! 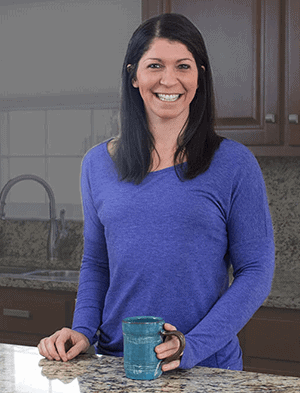 Gluten free, grain free, low FODMAP, paleo, Whole30 and AIP friendly (no nightshades). Add the beef stew meat and saute for 10 minutes, stirring the meat at least one time to brown on at least 2 sides. While the beef is browning, peel the parsnips and chop the parsnips, carrots and celery. Once the beef is done sauteing, add the chopped vegetables to the instant pot on top of the beef. Add the lid to the instant pot and turn the vent to "sealing". Cook on high pressure (manual mode) for 20 minutes. After the instant pot has come to pressure (takes about 10 minutes) and cooks for 20 minutes, the instant pot will beep indicating that it is done. Allow the instant pot to naturally come down in pressure for at least 20 minutes. If needed after 20 minutes, manually release pressure, making sure to keep you hand out of the way of hot steam. Add in frozen peas and stir well. Omit the peas for Whole30 and AIP protocol. 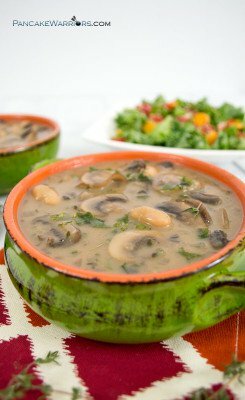 I am obsessed with the Instant Pot and my family loved this recipe. Just like every other busy mom, I’m always looking for new Instant Pot recipes. This one looks PERFECT for my husband and 2 sons! Thanks for sharing.